Everything Just So: Charles James: Beyond Fashion, Behind the Scenes! Charles James: Beyond Fashion, Behind the Scenes! The gorgeous flower sculpture in the Great Hall at the Met. I thought I’d share some fun behind-the-scenes pictures I took last week at the press preview for Charles James: Beyond Fashion at The Metropolitan Museum of Art. It was a crazier preview this year than in previous years because First Lady Michelle Obama had been at the ribbon-cutting ceremony for the opening of the new Anna Wintour Costume Center first thing in the morning. So there were actually two previews—one for a small group of select press and celebrities, and the second for the rest of us. I’m happy to report New York Times photographer Bill Cunningham, invited to the first preview, joined The Rest of Us. He stood outside with a big smile on his face, checking out the long line to get in and taking pictures of press people whose outfits he liked. Once inside I heard him say he skipped the earlier preview because he thought security would be too tight. Bill was so happy to see his friend. He was greeted by many at the preview! I also heard him tell a friend of his, “You cahn’t see anything or anyone in here, it’s so dahk.” (And yeah, he really talks like that, with the Boston accent). And he was right, in the second half of the exhibit that houses the gorgeous gowns that made Charles James’ reputation as a couturier, it is very dark and difficult to see. No matter! I turned on my flash, like I learned from Bill himself two shows ago at the preview for Schiaparelli & Prada: Impossible Conversations, and got to work taking pictures. This 1948 gown was owned by Millicent Rogers. Using flash was the only way to pick up the gorgeous tones in the dresses, such as the one above, of peach silk faille and orange silk taffeta, owned by Millicent Rogers, heiress to the Standard Oil fortune. This gal in the black gown got stares everywhere she went. She was definitely the best-dressed! A lady in a black ball gown posed in front of the exhibit entrance while a photographer took her picture. I’m assuming they were from a magazine. Since she was the best-dressed at the preview she got attention wherever she was. The event team still had so much work to do at 1:30pm! The beyond-gorgeous flower sculpture in the Great Hall was meant to look like a deconstructed Charles James gown. It was made of thousands of fresh roses, mostly yellow, but also coral, pink, red, and white, and it smelled like heaven when you walked by! The event crew still had a ton of work to do when I was leaving at 1:30pm and a member of the Met staff kept hustling anyone who stopped to take pictures to move along. Notice the pink and red roses in the inside spiral. These three did NOT look happy. Once outside, I walked along Fifth Avenue to get photos of the activity surrounding the tents and red carpet prep. The barricades were already up and I saw a plainclothes officer of the NYPD going through the trashcan and newspaper kiosks to make sure there were no suspicious packages. New York’s Finest were on the job! The tents covering the red carpet outside the Met. I saw Nigel Barker about to file his report for E! News. I’d just seen him in the Great Hall too. I think he looked at me because we were easily the tallest people in the room. He’s 6’4 (oh my!) and I had high heels on so was at six feet myself. Nigel Barker about to go on camera. He is very handsome in person. Yowza! The front of the Met with the red carpet already in place. Hamish with SJP and Stella McCartney taking a selfie earlier in the day. Photo by Michael Loccisano/Getty Images. On my way back to the subway I decided to walk on Madison Avenue, one of my favorite streets in all of New York. Who should I spy on the corner of Madison and 80th Street but Vogue’s International Editor at Large Hamish Bowles? I normally do not approach famous, or even semi-famous, people I see in the city but there are a few I would break this rule for and Hamish is absolutely one of them. He is the man who was a creative consultant for the fabulous Jacqueline Kennedy: The White House Years exhibit at the Met in 2001. He also curated the intimate and stunning BALENCIAGA: Spanish Master in 2011 at the Queen Sofía Spanish Institute. I am a big fan! So I went for it and introduced myself to him right there on the street, then told him I’d just seen him at the exhibit and asked if he’d helped curate the show. He agreed with me that it was so beautiful, but that it was the work of Harold Koda, and Jan Glier Reeder, both of whom I have interviewed and met at prior exhibits. Hamish was very dapper and good-looking in his gray suit, and just as charming as you’d expect him to be. I wished him well and we both went on our separate merry ways! Lovely flowers on 80th Street. By time I saw these gorgeous flowers, also on 80th Street, outside one of those beautiful townhouses everyone would love to live in, I thought, Oh Manhattan, you’re just showing off now. You big flirt. I tell you, even after over seventeen years of living in NYC, there are days when I can still feel the magic of the city and last Monday was definitely one of them. 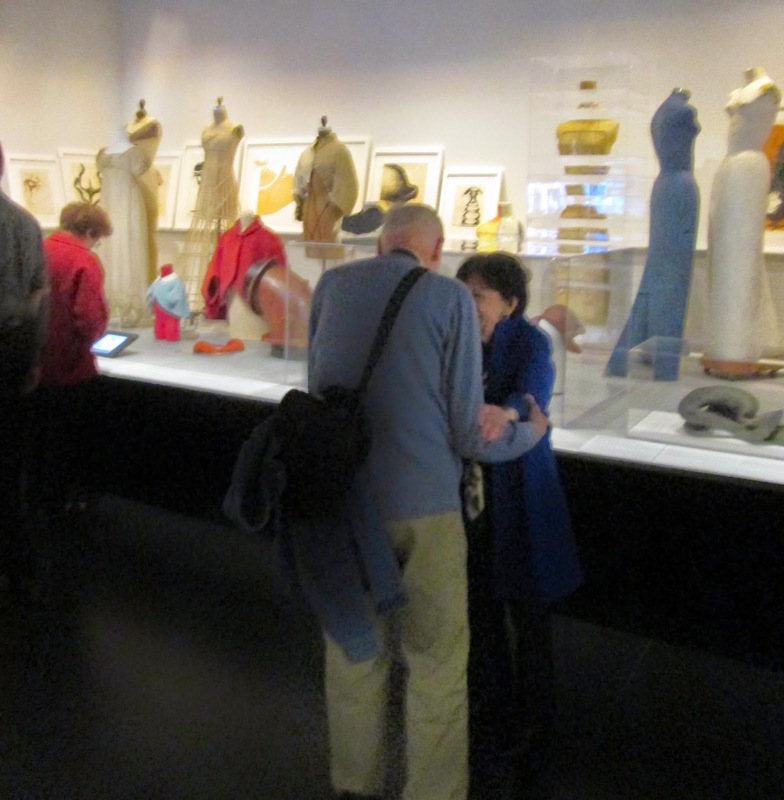 Charles James: Beyond Fashion is on view until August 10, 2014. Loved this post, Jill...the behind the scenes and your encounters on the street...it is so much fun to be bold and approach people...it usually goes well! Good for you! What an spectacular opportunity! I would have been in LaLa-land and unable to do my job. I have had opportunities to interview celebrities and I always break-out in a cold sweat. I would have dashed out across the street to do a selfie with Nigel. Hubba hubba...he is gorgeous. I could imagine Millicent Rogers in the Charles James gown. I bet she looked flawless! Oh my! I am very jealous, I would absolutely love to see this exhibition, I really hope it travels to London. It look fabulous. So lovely that you met Hamish too, he is a darling.